Born in London, Ben Eine is one of the most successful street artists in the world and is regarded as a pioneer in the exploration of graffiti letterforms. Eine first came to prominence in the “commercial” graffiti scene through his symbiotic partnership with London graffiti artist Banksy. In 2010 the UK Prime Minister David Cameron gifted his artwork to President Obama, while a particular area of the East End was named ‘Alphabet City’ after his colourful array of shopfront ‘shutter art’. 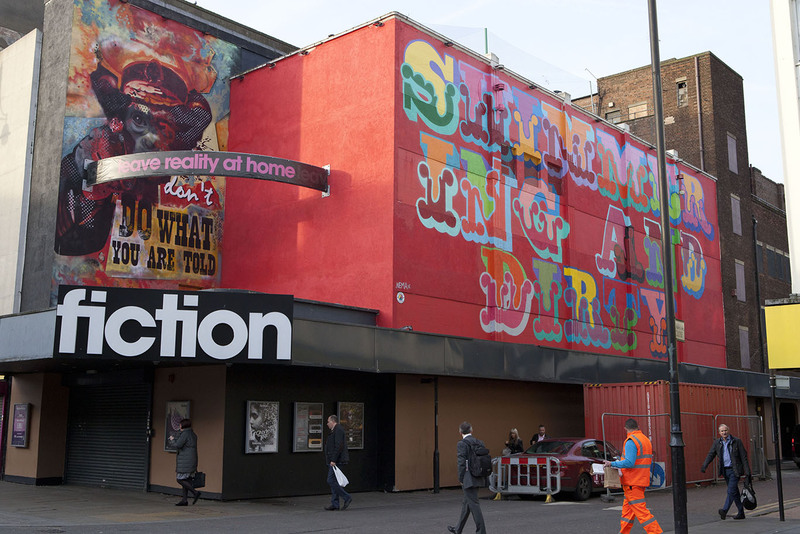 Eine’s mural is placed on the side of FICTION nightclub and depicts the lyrics ‘SHIMMERING AND DIRTY’ from the Underworld anthem ‘Born Slippy’ who were based in Romford for many years.